April is the season to start thinking about planting summer bulbs in the garden. Most species are tender to the frost, so unless you allocate time in the autumn to protect them from the cold there’s a very high probability that they will not survive the winter. One way to aid with winter protection is to plant them in pots so that you can either cover the whole pot with fleece, mulch with straw or move them to a more sheltered place (a cool greenhouse or conservatory is ideal) to protect them. Agapanthus look particularly amazing in pots as they have good strong foliage at the bottom of the plant and this provides form and balance to the tall spikes of blue or white flowers that rise above them. Agapanthus bulbs. You’ll need 1 bulb every 20-25cm. So for a pot with diameter of 50cm you’ll need 4 bulbs. Agapanthus africanus ‘Headbourne Hybrids’ is a good reliable variety. Place the crocks at the bottom of the pot and position it in a sunny sheltered spot in the garden. Fill the pot with compost and mix in a couple of large handfuls of horticultural grit if using it. Agapanthus prefer free-draining soil, so the grit will aid with this. Plant each bulb with their crown (top) just 5cm below the surface, 20-25cm apart. Top up the pot with compost if required and press lightly. 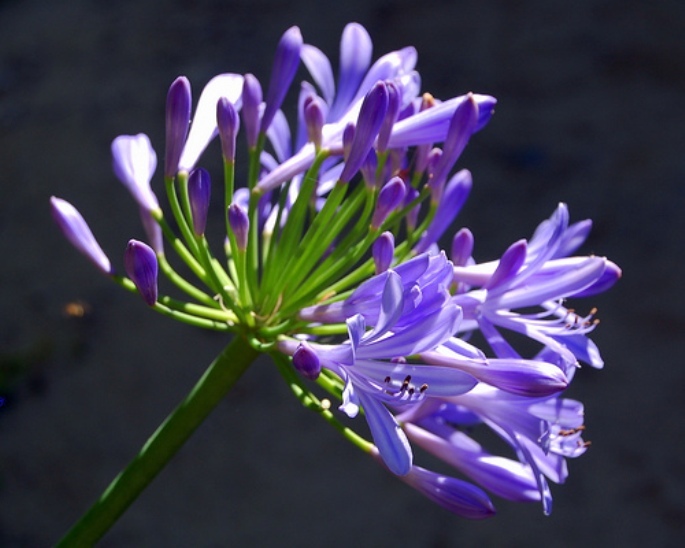 Don’t be alarmed if your agapanthus doesn’t flower during the first year. Sometimes it takes a while for them to establish, but it will definitely be worth the wait! Water regularly but sparingly throughout the growing season and feed fortnightly with a high-potash fertiliser like tomato feed.